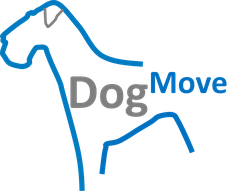 The principle of DogMove - dogmove Webseite! The core element of DogMove is a multiple balloon which can be triggerd automatically by a speed recorder and/or with a handheld transmitter by the dog owner. The balloon integral part of the dog harness and set in the abdominal area between the fore and hind feet. The dog will be warned by a acustic signal inside the harness bevor triggernig the balloon. This effect of conditioning will learn the dog to abandon hunting in a early stage. The balloon can be triggerd if the dog is not following the acustic warning. The balloon will bw filled slowely within 3 to 5 second. In case that the dog is already out of view the balloon wil be automaticlly open by the speed recorder. The balloon wil be filled up slowely and not pumped hardly. The dog is not stopped abrubtly and will not be hurt. The balloon will disturb the legroom and the swing of the animal. The individual compartments of the balloon leads to the fact that the system will still be working even if a part will be destroyed in action. DogMove is part of the dog harness and is not specially visible. An acustic signal is integrated in the herness which can be triggerd by handheld transmitter or speed recorder.